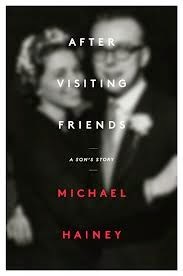 After Visiting Friends by Michael Hainey was an interesting and at times lyrically written book about Hainey as both a journalist and son looking for information on the circumstances of his father's death decades ago. It wasn’t so much a question of whether foul-play involved in the death, but rather why the details provided around his father’s death didn’t make sense to Hainey, and what the actual truth of where he died and with whom was. There was definitely an element of “is it worth it trying to find out?” to this question of what happened some thirty years prior and at times the story felt to drag a bit, but it mattered to Hainey and was interesting to see what he would learn. Also, the book itself was a fairly impressive read in terms of the dexterity with language used and duality in relation to words and their meaning throughout, with everyday events serving as metaphors or indicators of much larger quests ongoing. Hainey was able to find the truth of where his father was at time of death through dogged reporting and it was interesting reading of both his quest for information and the power someone can still hold long after they're gone. There’s also a fascinating and profound conclusion to the book as the author shares with his aging mother what he learned, leading to a discussion of who people were, how we remember them and how we work through the things that are most important at any given point in time.